Ack, I'm really sorry, I don't know what's going on with formatting on this site, but I can't make it do what I want it to do! I'm not computer stupid, but everything looks fine in drafts but then when I post, all the formatting is shot. I'm really sorry! Where did I get it? I bought it on Kindle, it was 99p and although I've never read anything by Juno, I own a few so I thought I'd add this to the collection. I was scrolling through my Kindle and thought I'd give it a go. What's it about? Fliss and her mum are moving from London to Wales to live with Fliss' grandma, Margot. Fliss' mum has had cancer and Felicity has been looking after her, but now Margot steps in. Felicity has to start at a new school which is far removed from her private school in London, and she hates how small the new town she's living in is. Margot isn't a typical grandma and Fliss struggles to get on with her. But then she finds Margot's diary hidden in the attic, from when Margot was evacuated from London to the very farm she now lives on. Intrigued, Fliss starts to read it. For some reason, the novel is set in the late 90s, which I found really bizarre. I think partly it was because it made sense for Margot's age - she's 70ish in 1998, whereas if the novel was set now, Margot would be 90 and it would be strange to move in with her at that age. I thik partly too that it was because the internet was in its infancy, which again makes sense for the story. But otherwise it was just a distraction and wasn't overly well done, I didn't feel. Would I recommend the book? Kind of? 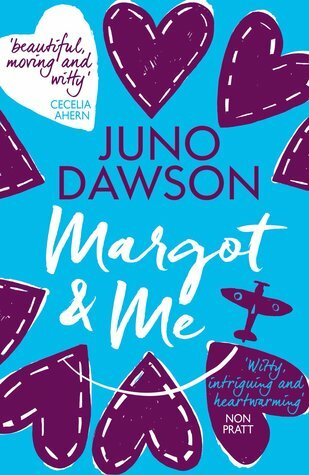 I've heard that this is the best of Juno's novels, so if you already like her stuff, then this will probably be right up your street. For me, it didn't quite gel. I found Fliss to be a pain in the bum, and I really didn't like the 90s setting. Parts of it just didn't ring true. I really liked Margot, though. I'd have liked a whole novel just about her! She was badass! What other books is it like? I think it's quite like A Monster Call, which I reviewed recently.